The Patronila Bedroom collection, styled with Brass inlay, encompasses an enchanting look that fuses a modern touch with an elegant feel, giving this bedroom suite a luxury apparel. Quality craftsmanship combined with authentic Indian undertones and rich calming color schemes offer mesmerizing opulence. Our premium bedroom products are meant to inspire and fulfill the most inner desire for comfort, while creating an airy-relaxed feel for the home. 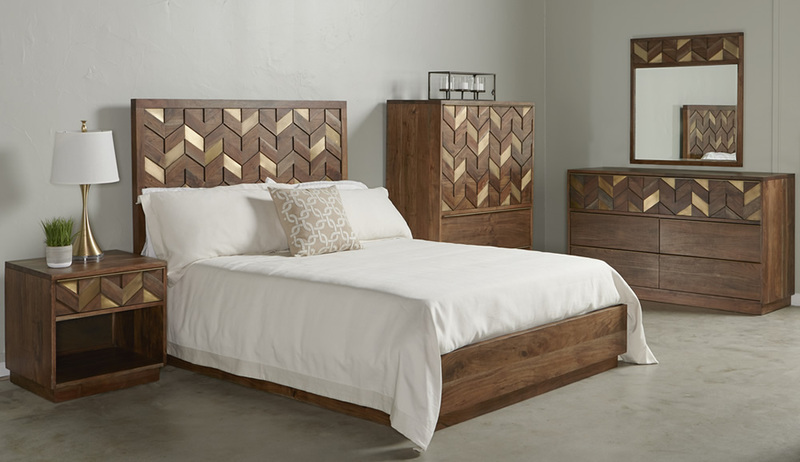 The collection made of Acacia wood, tall headboard bed and extra deep drawer case pieces includes under mount ball bearing self closing glides with antique brass finish on metal pulls, offer enduring beauty, style and elegance, making it easy to select durable, responsibly sourced bedroom furniture pieces for the home.